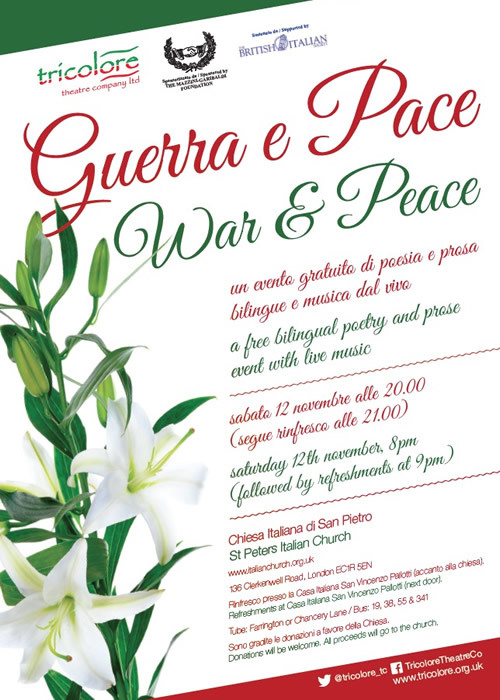 This Italian community event took place at St Peter's Italian Church, Clerkenwell, Londo, in November 2016, exploring Italian poetry on the theme of ‘War & Peace’(Guerra e Pace) from Italian Unification through to the 1st and 2nd World Wars and then the 50s to the 80s. CLICK THE IMAGE FOR A FULL PROGRAMME, PLUS A REVIEW BY ANDREA DEL COMÓ OF THE LONDON LIBRARY. The company for ‘Guerra e Pace’ included a leading Italian accordionist from the Anglo Italian community, as well as lead character Danilo in 1989 film ‘Queen of Hearts’, about the Italian quarter. 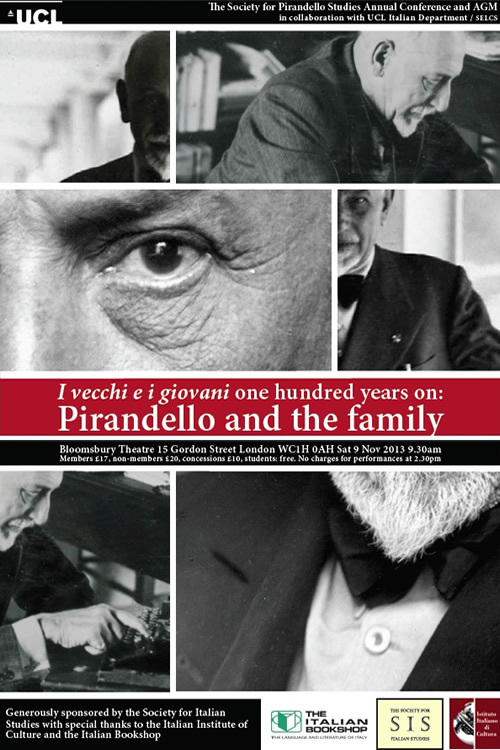 Our thanks to the Mazzini-Garibaldi Foundation for sponsoring our event and to The British-Italian Society for their support. Thank you also to Andrea Del Cornò of The London Library for his research. 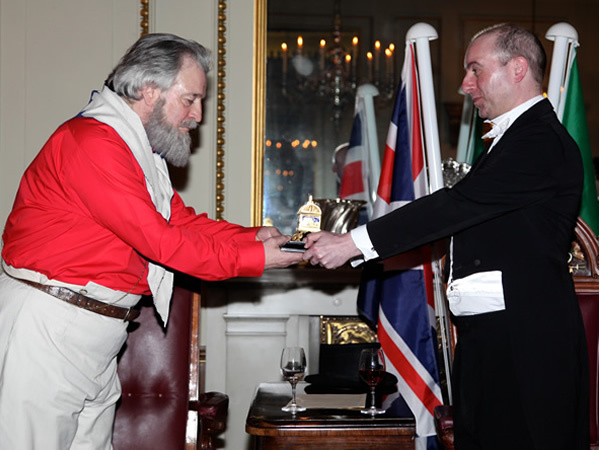 During 2014, Tricolore Theatre Company took part in two major events to commemorate the Guiseppe Garibaldi's historic visit to London in 1864. The Worshipful Company of Fishmongers granted honorary freedom of the Company to General Garibaldi during his visit to London in April 1864. Tricolore re-enacted the event (picture below) during a Reception and Dinner at Fishmongers Hall in April 2014. General Garibaldi was also honoured at Freemasons' Hall in Convent Garden. 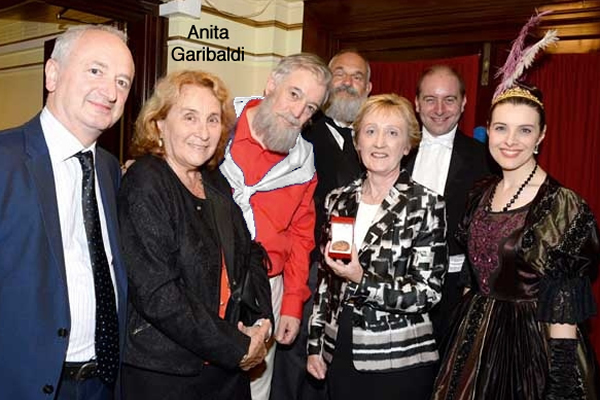 Here too, Tricolore perfomed a re-enactment in June 2014, in the presence of Anita Garibaldi, at the opening of an exhibition to mark the centenary. Tricolore's actors on these occasions were Edmund Dehn, Gregory Cox, Phil Gerrard and Nadia Ostacchini. 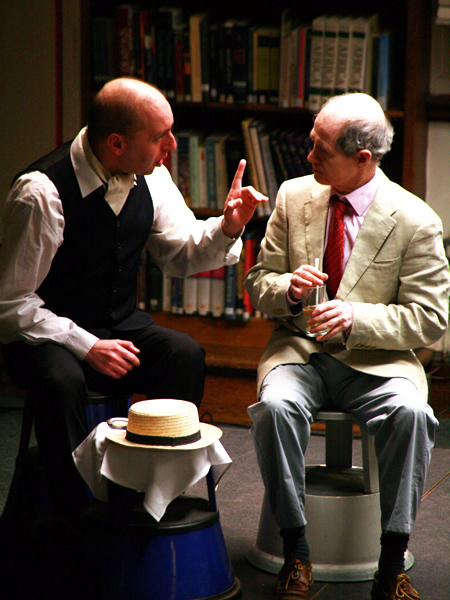 In January 2014 at the Westminster Reference Library, Tricolore performed script-in-hand readings of The Man With The Flower In His Mouth by Luigi Pirandello, and A Spoonful of Sadness, a new play written by Dimitry Devdariani, who directed both readings. 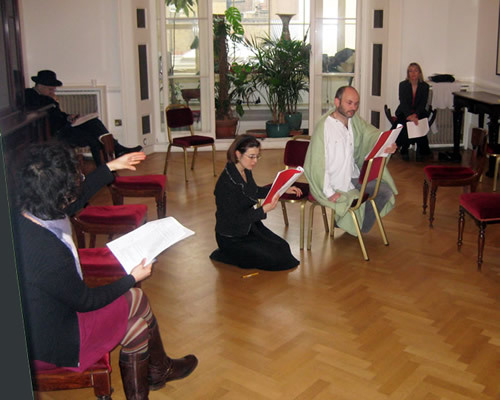 Tricolore's adaptation of The Man with the Flower in His Mouth was also performed as part of the annual Pirandello conference at University College London in November 2013. The actors on these occasions were Phil Gerrard, Terry Jermyn and Nadia Ostacchini. 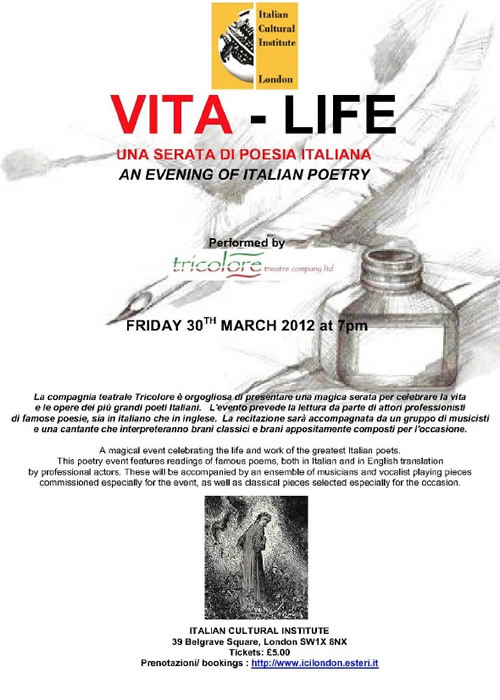 In March 2012, Tricolore presented a magical event at the Italian Cultural Institute in London, celebrating the life and work of the greatest Italian poets. This event featured readings of famous poems, both in Italian and in English translation by professional actors. These were accompanied by an ensemble of musicians and vocalist playing pieces commissioned especially for the event, as well as classical pieces selected especially for the occasion. 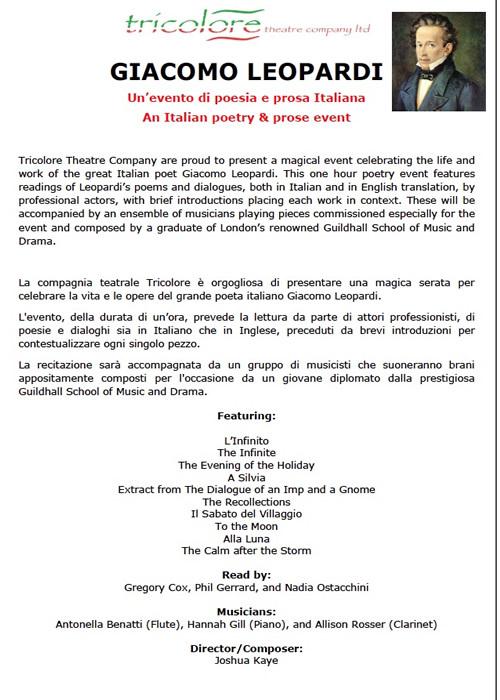 Tricolore presented a celebration of the life and work of the great Italian poet Giacomo Leopardi at the Italian Cultural Institute in September 2009. This one-hour poetry event featured readings of Leopardi’s poems and dialogues, both in Italian and in English translation: L’Infinito, The Infinite, The Evening of the Holiday, A Silvia, Extract from The Dialogue of an Imp and a Gnome, The Recollections Il Sabato del Villaggio, To the Moon Alla Luna, and The Calm after the Storm. The readers were Gregory Cox, Phil Gerrard and Nadia Ostacchini. Leopardi's work was accompanied by music specially composed for the occasion. Antonella Benatti (Flute), Hannah Gill (Piano), and Allison Rosser (Clarinet) were directed by the composer, Joshua Kaye. 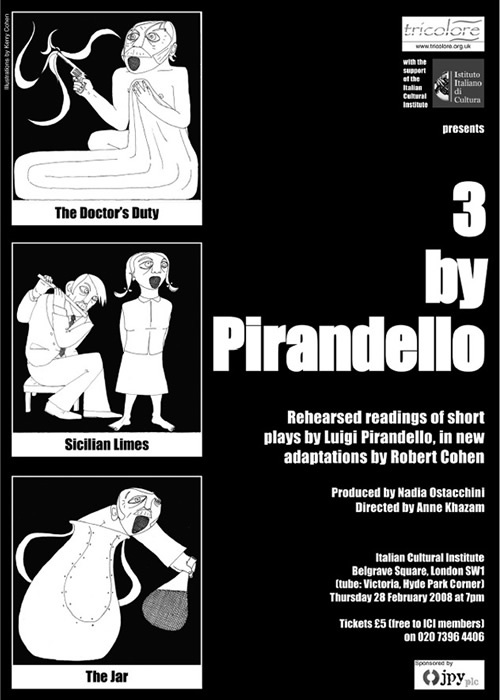 In February 2008, Tricolore gave rehearsed readings of three Pirandello plays in new adaptations by Robert Cohen at the Italian Cultural Institute in London: The Doctor's Duty, Sicilian Limes and The Jar. The cast members were Lucy Appleby, Robert Cohen, Gregory Cox, Robin Miller, Nadia Ostacchini, Denise Scott, Tucker Stevens and Martin Wimbush. The plays were directed by Anne Khazam.